Welcome to the website for the Aiken Pickledillys! Our intent is to promote the game of pickleball and to provide competitive and social pickleball activities. Our goal is to encourage sportsmanship and camaraderie through fun and exercise by playing the exciting and addictive sport of pickleball. The game is easy to learn and really fun to play. It can be played on a variety of levels from casual to very competitive. Pickleball offers players of all ages a good physical workout and the opportunity to meet a diverse group of people who share the passion that surrounds this exciting sport. We play at the Odell Weeks Activities Center on six indoor courts. Go to the "Calendar" tab on the main menu for our current playing schedule. In addition, we have 4 purpose built pickleball courts and 4 dual purpose pickleball/tennis courts located behind Odell Weeks. These 8 public lighted courts are available year round. Odell Weeks is located at 1700 Whiskey Rd in Aiken. The phone # is 803-642-7631. In order to provide the best possible playing experience for everyone, the Pickledillys operate under a set of guidelines. Currently we have three types of play spread throughout the available times each day. These include drop-in play with all levels mixing together, drop-in play with courts designated by skill level, and court reservation play. When courts are designated by skill level, we have different schematics (weekday mornings, weekday evenings, and weekends) based on the court usage for different skill levels during those times. These designations are periodically reviewed and adjusted. All players who participate in drop-in play by skill levels need to be rated by the committee. Visitors may play for a brief period at the level the player representatives feel is appropriate. Players who are visiting for a longer term and who have a rating at another location should check with the player representatives at that level to determine if that rating is acceptable for our local system. 1) You must have at least four people committed to playing on the court BEFORE you make the reservation. At least four names MUST be included on the sign-up The only exception to this is if a court has not yet been reserved by the morning of its availability. In that case, it may be reserved by two people. 2) Please be considerate of your fellow players and choose to attend either drop-in play or court reservation time, but not both on the same day. It is not allowed for a player to be incuded on two court reservation slots on the same day. During the winter months when court availability is limited, a player may not appear on a court reservation more than three days in a week. Mo Garcia, Wojciech Adamek, and Grace Vance are available for private and semi private lessons. Please go to the "contact us" page on the main menu to contact Mo, Wojciech, or Grace. Please contact the instructors directly for available times. Please furnish the instructor with a receipt. Please see the calendar for dates and times. Residents of the City of Aiken can pay for Pickleball in one of two ways. Annual Pass: $75 per year, expires one year after purchase. Annual Pass with membership: $75 per year (expires one year after purchase). *A recreation membership is secured at a cost of $75 annually per individual or $125 annual per family for non-city residents. Get on the ball and join our e-mail list! Click on the ball to join! 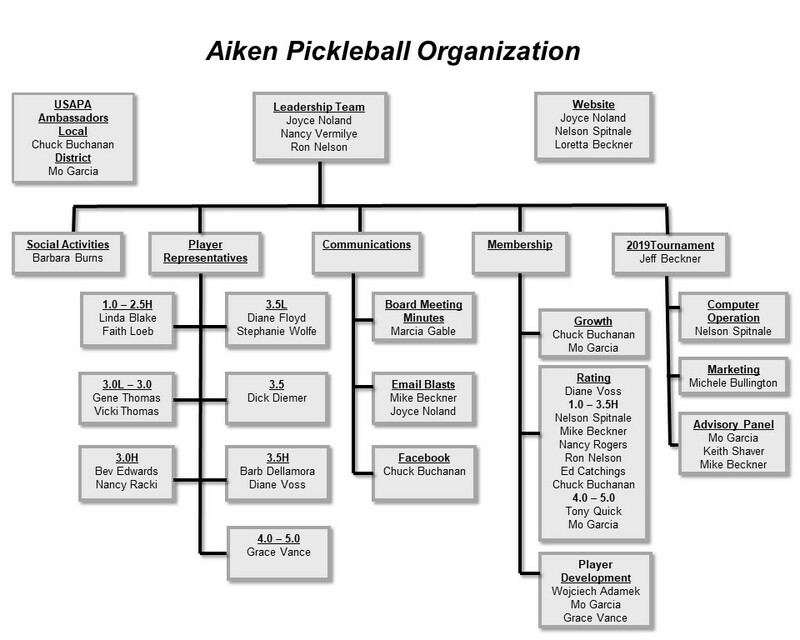 Aiken Pickleball needs your help! We are looking for volunteers for a variety of positions. Click here if you are willing to help. To ensure maximum usage of the courts,iIf a court is still open for reservation on the morning of the slot, the court may be reserved for use by only two people. Fun was had by all at the Christmas Social on December 6th. The food was delicious and the holiday mood was made even brighter by the live music provided by Bill Wright on his saxaphone. See below for details on the Beech Mountain Pickleball Experience in August. George Buggs has taken the initial steps in providing a two-hour pickleball clinic at Eustis Park in 2019. Aiken pickleball player Diana Hunt was recently fetured in Bella Magazine for her interaction with tigers in Thailand. After a small opening bump with finicky keys, fun was had by all at the first day of play at First Presbyterian Church. If you want to give the new facility a try, see the calendar for times, and sign up using the appropriate link under "Sign-ups" on the main menu. Click here to check out this article on pickleball and longevity in the Aiken Standard. The October Round Robin was a great success. Thank you to Nancy Vermilye for all her hard work in organizing this event, and thank you to all the court monitor volumteers who helped to make everything run smoothly. We are pleased to announce that Diane Voss has agreed to assume the role of rating committee chairperson.